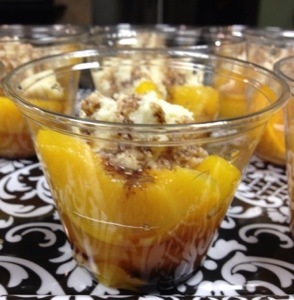 Turn ordinary canned peaches into an extraordinary dessert! Divide the peaches among 4 small bowls. Mix mascarpone with white balsamic vinegar and divide among bowls. Drizzle Traditional 18 Year balsamic vinegar onto each bowl and sprinkle a pinch of vanilla salt on each. The peaches and mascarpone may be made up to 4 hours before serving. Remove from refrigerator before serving then drizzle vinegar and sprinkle pinch of salt.